AP Nirudyoga Bruthi Scheme Online Registration – Mukhyamantri Yuvanestham Unemployment allowance | AP Nirudyoga Bruthi Scheme 2018 – Online Registration, Eligibility @ ap.gov.in | AP Mukhya Manthri - Yuva Nestham Nirodyoga Bruthi Scheme for Unemployee Youth in Andhra Pradesh. AP Nirudyoga Bhruthi Scheme Online Apply AP Nirudyoga Bruthi Registration Nirudyoga Bruthi AP Online Registration AP Nirudyoga Bruthi Apply Online Nirudyoga Bruthi Last Date AP Nirudyoga Bruthi Scheme Online Registration ap.gov.in Nirudyoga Bruthi Online Registration Nirudyoga Bruthi Online Application AP Yuva Sadhikarika Nirudyoga Bhruthi Scheme in AP – Unemployment Allowance for Youths- Eligibility Details, Online Registration Process. Mukhya Mantri-Yuva Nestham ఎపి నిరుద్యోగ బృతి పథకం Nirudyoga Bhruthi Scheme - Unemployment Allowance for Youths- Eligibility Details, Online Registration Process. The state govt. of Andhra Pradesh is going to launch AP Yuva Sadhikarika Nirudyoga Bhruthi Scheme Unemployment Allowance. AP Nirudyoga Bruthi Apply Online Accordingly, each unemployed youth will get an allowance of Rs 1000 per month till the time candidates they will get job. Subsequently, Andhra Pradesh govt. will launch this scheme in order to benefit around 10 lakh educated and job-less candidates. The primary objective of this scheme is to provide financial support in the form of monthly pension to eligible unemployed candidates of the state. For the successful implementation of Mukhya Mantri-Yuva Nestham scheme, govt. agencies will collect age wise data of jobless candidates. Andhra Pradesh Govt is going to implement a Scheme for Un Employed Youth in AP through this scheme which provides Rs 1000 per month to the youth. ఎపి నిరుద్యోగ బృతి పథకం Mukhya Manthri Yuva Nestham Scheme by Andhra Pradesh State Govt How to Register Online at Official website for the Financial Support from AP Govt. Eligibility Educational Professional Qualifications Diploma Equalant OR Degree and its Equalant Un Employee youth has to Logon to the Mukhya Manthri Yuva Nestham Web Portal. All the candidates between the age group of 18-35 years can apply for this scheme. Mukhya Mantri-Yuva Nestham ఎపి నిరుద్యోగ బృతి పథకం scheme is applicable to only 1 unemployed candidate in a family who has passed the senior secondary (12th) examination. Furthermore, Andhra Pradesh govt. will give this financial assistance so that the candidates can pursue skill development. This scheme will surely result in getting appropriate job for jobless youths. 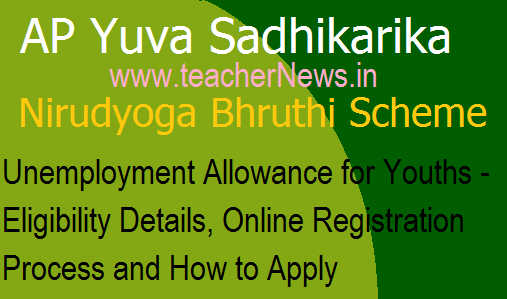 AP Nirudyoga Bhruthi Scheme Online Apply AP Mukhya Manthri - Yuva Nestham Nirodyoga Bruthi Scheme Online Registration for Unemployee Youth, Unemployment Allowance for Youths- Eligibility Details, Online Registration Process.